The awkward moment when 你 ship Stefan with everyone...except his girlfriend. . HD Wallpaper and background images in the The Vampire Diaries Couples club. I only ship Stefan with Cactus <3 They're my favorite crack ship. how are you different exactly?.....if im not mistaken aren't you a stelena shipper?....so your not different and you ship stelena just like other people do. Calm down. Its just a bit of a funny picture because the person likes Stefan. LIKES Stefan with people other than who he is with on the show. Its nothing to be offended about. And if all DE shippers just 'follow pretty blue eyes' like you say then why is it that most DE shippers dont ship Damon with anyone else? Don't go bashing and generalising DE shippers just because they support someone other than Stelena. I love Stefan as a character. I don't like him with Elena but I do love him with Katherine. I've actually meet SE fans who also like him with Katherine, so it is not unusual for people to ship Stefan with someone other than Elena. The person who made this pick was merely pointing out thats its funny to ship a character with everyone other than who he is currently with. And from what I can see no one in these comments has even mentioned Damon.... So why are you bringing him into this? And the only mention of 'best couple ever' is one about Stactus. Not DE. So back off. and @jeriemy why bring DE into this? your making assumptions that have nothing to do with this picture. come on, this is from a DE fan dont lie because according to you elena looks better with Damon point, this is the reason of this pic, because you want to everybody believe that stefan doesnt belong with ELena. ^^i don't think so we love damon and elena toghter bcuz they have so a great chemistry toghter and not bcuz elena is the main character !! I love Elena with Damon because she's his humanity and she's the only one who likes him for who he is. She was willing to see the good beneath the bad, when nobody else, not even his own brother could. So main character or not, they'd still be my OTP. But I don't know why we even bother to try and explain things to you, when you clearly told me yesterday that you're here to bother DE fans. see? now THIS is an awesome SE fan, she can still appreciate the humor of the pic even if she doesn't exactly agree. And she didn't come here to bash the pic or other couples or most importantly, THE FANDOM. 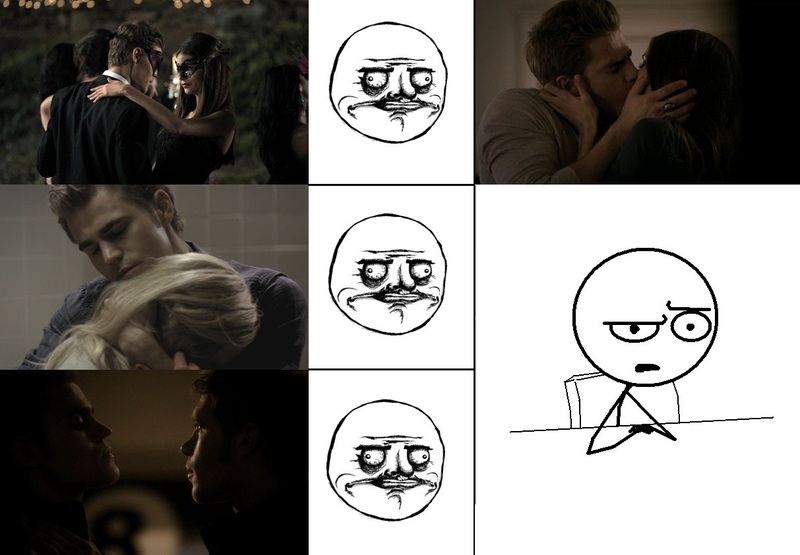 This picture is not saying ANYTHING bad about Stefan. And nobody has ever mentioned the actors. You are the only person who hates on the actors, or I guess it's just Ian. Bamon is not even a part of this picture so I don't know why you feel the need to bring it up. I am starting to feel sorry for you since you have an obvious need to be an attention whore. well, because when you saw Bamon pics or something like that, you do your best for making Bamon fans bad and about the attention whore this is you DE fans you have no lifes or lifes pretty borings so you had time for making vids, pics and articles about a couple who doesnt exit and proclam yourselfs like queens of the fanpop.